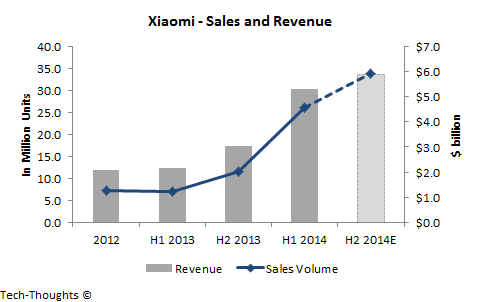 Yesterday, Xiaomi announced that it sold 26.1 million smartphones in H1 2014, totaling $5.3 billion in revenue. Xiaomi's goal is to sell 60 million smartphones and generate $11.2 billion in revenue by the end of the year, but these figures seem too conservative when compared to their current performance. 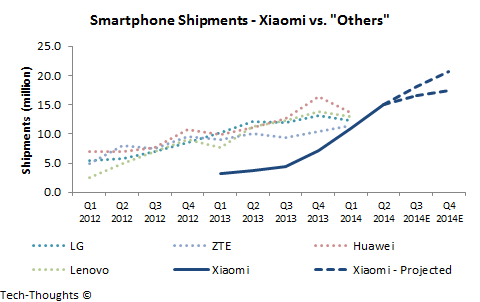 Xiaomi needs to sell ~34 million smartphones in H2 2014 to hit that 60 million mark, but that would imply a significant slowdown in growth. Looking at the chart above, Xiaomi would need to sell ~65 million smartphones in 2014, or ~39 million in H2 2014, to maintain their current growth trajectory. This should result in roughly ~$12 billion in annual revenue after taking into account expected ASP declines in line with Xiaomi's business model. This will be a crucial test to gauge Xiaomi's ability to scale and cater to multiple geographical segments.